Kaela Harmon ’05 promotes her new book. 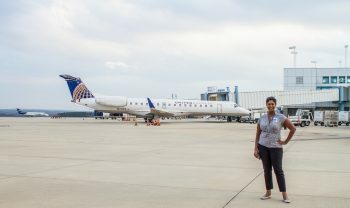 Although she’s still new to a job as public information specialist senior for the Austin-Bergstrom International Airport in Austin, Texas, she has spent the last five years working with airports and the communities they serve. She notes that an airplane is “a mobile asset.” Airlines can make decisions at any time about where to move and house their planes, what routes to add or drop, and where important connections will be made. That makes it incumbent on communities and airport officials to make a strong case for their air-transportation needs. In Austin, Harmon is responsible for media and public relations, and she serves as a liaison for the airport and the airlines. On a typical day, she could be writing a press release about a new service, such as a recent announcement of a new nonstop flight between Austin and London, or planning and hosting an event. She also crafts talking points related to the airport’s public announcements and serves on a team of five to manage the airport’s social media accounts. “The work is very dynamic. It’s a perfect blend of analytics and creativity,” she said. She also has enjoyed the relationships with industry colleagues that she has formed. In her hometown of Columbia, she was public relations and government affairs manager for the Columbia Municipal Airport, before being recruited by Sixel Consulting Group, where she worked for almost a year helping local airports make their cases for increased air services. She then did freelance consulting until taking the job in Austin in June 2017. While in Columbia, Harmon was recognized for her work by being named to several lists, including 20 Under 40, 40 Under 40, Columbia’s 2014 Top Women of Influence and Influential Women in Business. Harmon did not set out to work in airport public relations. She was working for a small museum in Columbia when she saw an advertisement for the job at the Columbia airport. She applied and accepted the job, which set her on her current career trajectory. Kaela Harmon ’05 at the Columbia, South Carolina, airport. While helping with one of Columbia’s programs — Wings for Autism — Harmon realized she could take her passion for airports to another level. The program is a national effort for individuals with autism spectrum disorders or intellectual or developmental disabilities. Families practice the entire process of moving through the airport and boarding a plane, which helps relieve stress when they make a real trip. 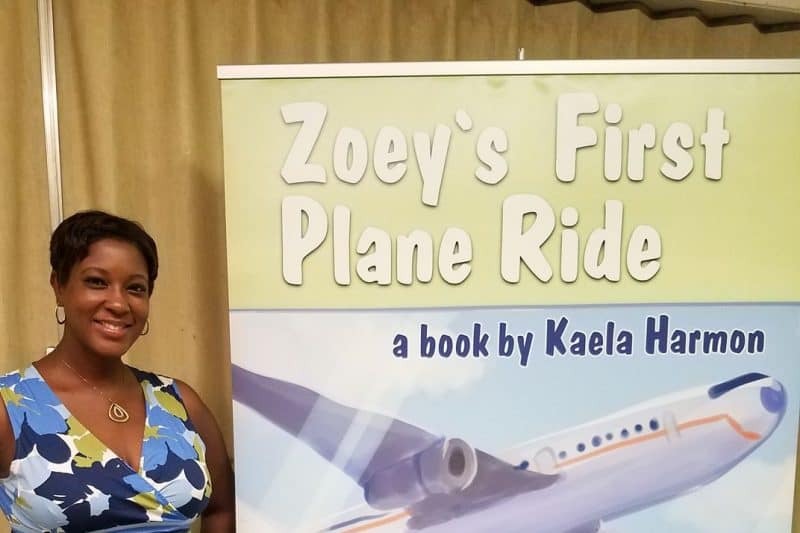 The experience inspired Harmon to write and self-publish “Zoey’s First Plane Ride” for children. While other books focus on airplanes, Harmon wanted to “pass along my enthusiasm for airports.” She walks the reader through every step — checking in at the kiosk, checking luggage and explaining where it goes on the conveyor belt, walking the concourse, understanding airport signage, boarding the plane — all the way through to baggage claim. “Airports can be overwhelming to children,” Harmon said, noting that the book has been well received. Some airports have picked it up to sell, and the airport in Roanoke, Virginia, purchased 100 copies to give to schoolchildren who toured the airport. Harmon developed her talent for writing and communications through her major in broadcast journalism and communications. Her high school guidance counselor in Columbia was a W&L graduate — one of the first female, black students on campus — and introduced her to the university. Harmon spent six weeks on campus for a summer-immersion program and after applying, returned for a visit. Walking along the Colonnade, “I felt I really needed to be here,” she remembered. She values the professors in her major who inspired and mentored her. “Bob de Maria was one of those rare people who takes you under his wing and pushes you to be better,” she said. Professors Dayo Abah and Claudette Artwick also stand out as important to her professional development. While on campus, she was involved with the Minority Student Association and helped charter Delta Sigma Theta sorority. She continues to be involved by serving on an advisory board for the journalism department. As well as participating in quarterly meetings, she and other board members review senior portfolios, looking at them with a professional’s eye to provide constructive feedback. As a young black professional, Harmon never wants to lose sight of the fact that “I’m standing on the shoulders of giants. Many made sacrifices to give me opportunities.” She hopes to continue to lay a foundation for those who come after her.